RayBiotech’s protein arrays spot purified recombinant proteins on a glass slide in an addressable format. 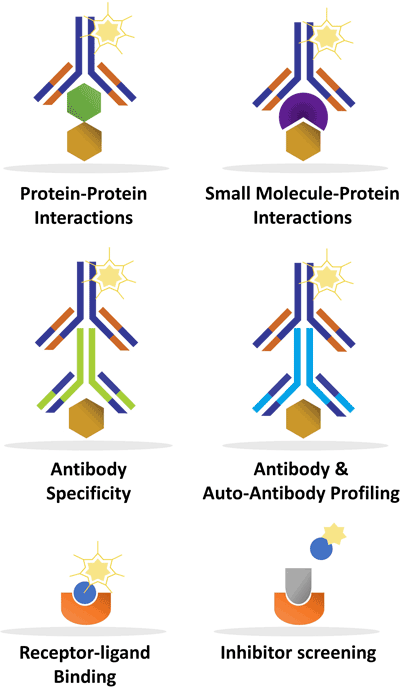 Protein arrays are used to study antibody specificity, small molecule-protein interactions, antibody and autoantibody immune profiles, and protein-protein interactions. In addition to our off-the-shelf protein arrays, we can create a protein array to meet your research needs. We can make your proteins. Our comprehensive recombinant protein service does it all, from gene synthesis to aliquoting. Don’t have the time or a compatible laser scanner to perform your experiment yourself? No problem! We offer free scanning and data extraction services for all of our arrays. For more in-depth analyses (e.g., biostatistics), check out our data analysis packages. To obtain a quote please fill out the Custom Protein Array Request Form (see below) and send to orders@raybiotech.com. Custom arrays are developed within 4-6 weeks and shipped with all necessary reagents, protocols, and an excel-based analysis software to quickly analyze the results! Create your custom array by choosing your proteins of interest from the lists below. Please see the table below for the gene name of each target. Click here for more information on the RayBio Human Targets. This protein has an Fc tag. Not compatible with anti-IgG secondary antibody. Please see the table below for the protein name of each target. Click here for more information on the RayBio Mouse Targets.